Be sure to add me to your favorites list! Sign up for my email newsletters by adding my Store to your Favorites Check out my other items! 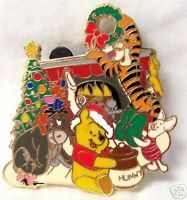 To learn more about us, Google goodnreadytogo GREAT STOCKING STUFFER Thissale is for ONE BRAND NEW: DISNEY WINNIE THE POOH, TIGGER, EEYORE, PIGLET CHRISTMAS PIN ON CHRISTMAS CARD NEW OFFICIAL TRADING PIN NEW PHOTOS ENLARGED TO SHOW DETAILS. DYE LOTS ON THIS PIN VARY AS SOLD AT WDW SO THAT POOH MAY APPEAR YELLOW, LIGHT BROWN OR GREEN; POOH ON PIN YOU RECEIVE MAY BE ANY OF THESE COLORS. PINTRADING AROUND WORLD PIN PIN ABOUT 1.75 X 1.625 INCHES CARD ABOUT 3.5 X 3.875 BUY IT NOW!!! at our Store 100% Guarantee of Authenticity Please be sure to ask questions before bidding so you are completely satisfied with your purchase. PAYMENT AND SHIPPING INFO We ship quickly, usually within 1 business day of receiving payment. PAYMENT IS REQUIRED WITHIN 7 CALENDAR DAYS except for Buy It Now items which require immediate payment. We accept PayPal. To pay with PayPal, you must have and ship to a confirmed USA address. Shipping for this item is to USA only. Florida buyers pay 6.5% sales tax. We give feedback on all completed transactions once we know you are satisfied with the transaction and have left feedback for us. Thanks and Happy Bidding!! !